Very desirable monster-related collectible. Hard to find in this condition. This was an unusual cross-over. A monster movie being featured in a "How-To" magazine. Underwater photography was fairly new at the time and this article treats the filming of the "Creature" as one of the latest techniques in movie-making. 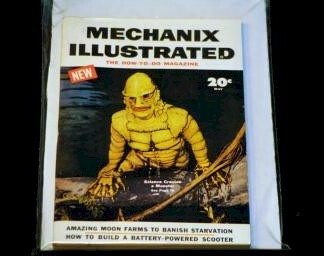 The "Creature" himself was a diver in a monster suit (a fellow named Ricou Browning). Other divers were always nearby(out of camera range), ready to provide oxygen for Browning when the cameras weren't running. Website design and hosting by Sohodojo Business Services. Item 245 of 466 items displayed in viewer. 0 items in cart.